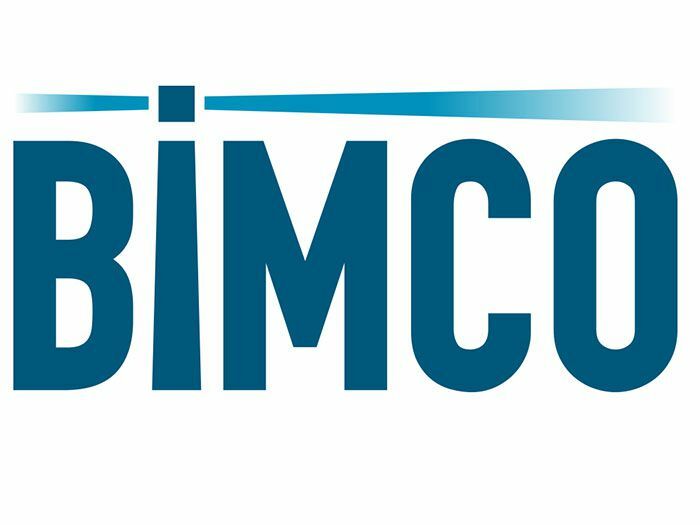 BIMCO, the world’s largest shipping agency, has called for international action to fight piracy, particularly in the Gulf of Guinea. According to a statement from BIMCO, which follows a report from the International Maritime Bureau (IMB), turning the tide of piracy and attacks would not be difficult in principle. However, the challenge is trying to get local and international institutions to work together, and unless this achieved it is unlikely the number of attacks will decrease. Speaking about the need for international cooperation to fight piracy, Jakob P. Larsen, BIMCO’s Head of Maritime Security said this: “Unless we see international naval support and close cooperation between international navies and local law enforcement, I doubt that we will see the numbers go down in any significant way. “Therefore, we need to step up the effort. Only then can we really turn the tide on piracy in the region. “From a strictly military and law enforcement point of view, this is not a complicated operation, and it has been done before in other parts of the World with success. “It may however be complicated from a political point of view. It all comes down to will. If local politicians and the international community are willing to support this, then it can be done relatively easily”. The IMB report showed that 2018 suffered 201 attacks, up from 180 in 2017. Furthermore, the Gulf of Guinea off the coast of Nigeria, was by far the most dangerous area. The region between the Democratic Republic of Congo and the Ivory Coast accounted for all six hijackings worldwide, as well as 13 of the 18 ships fired upon, 130 of the 141 hostages taken globally and 78 of 83 seafarers kidnapped for ransom. In total, attacks in the region more than doubled in 2018, largely due to political and economic instability in and surrounding the oil-rich Niger Delta. 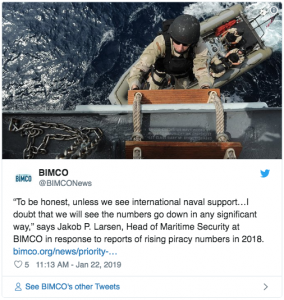 “In the light of the new report, showing that piracy rose in 2018,” Larsen continues, “we are once again calling for international navies to deploy to the region of West Africa primarily, and to cooperate closely with law enforcement from the region. “This is in the interest of everybody. It is obviously in the interest of the seafarers, but each and every one of the naval powers in the world have a strategic interest in this region, since there is a lot of strategic commodities that comes out of the Gulf of Guinea region.